"Sampath Speaking" - the thoughts of an Insurer from Thiruvallikkeni: Mission Madukkarai Maharaj - the taming of the tusker ! Mission Madukkarai Maharaj - the taming of the tusker ! Residents of Triplicane will ever remember the great majestic beautiful tusker named “Azhwar”. This was one who probably never misbehaved. This gigantic one would be bathed, decorated with Thiruman on its forehead and would accompany perumal purappadu. At the end of the purappadu have seen Azhwar offering ‘saamaram’ to Perumal and would walk backwards. It used to carry sacred water (Thirumanjana kudam) from the temple tank, being taken in a procession every morning. This extremely kind elephant was a favourite amongst children and grown up – alas, it passed away ! and its successor immediately made people understand how fearsome elephants are ~ in fact, what we see in Temples are no representatives of ones in wild !!! In wild, the loners are roguish. The rogue elephant of Aberdare Forest was a bull African bush elephant which terrorized several villages in the vicinity of the Aberdare Range in British East Africa in the early twentieth century, destroying crops and killing at least one person. The bull was reportedly so cunning, that it never struck the same village twice. The Aberdare Range is a 160 km long mountain range of upland, north of Kenya's capital Nairobi. Back home, we have the Western Ghats, also known as Sahyadri, a mountain range that runs parallel to the western coast. Madukkarai is a suburb of Coimbatore city located on Western ghats. 'Mission Madukkarai Maharaj' eventually turned into one of the biggest operations of the forest division, where not just forest staff numbering about 50 personnel, but police, fire service, revenue and health authorities also participated. ‘Operation Madukkarai Maharaj’ could be seen reported in all Tamil dailies and in all English media too. In a 10-hour, night-long operation that was the climax of a week-long pursuit, forest authorities were successful. It was a daunting task for a team comprising of Chief Conservator, rangers, guards, anti-poaching watchers, tribal youth – don’t let your imaginations run high – it was no Sandalwood poacher – yet a dangerous operation at that. It was taming of a wild tusker that had been damaging crops, hurting people and terrorizing many humans. Around 11.15 pm on Saturday, the tusker entered a human habitation in Madukkarai. A medical team, including forest veterinarian and District Forest Officer then set on the tranquilisation job. When the elephant was about to return to the forest around 4 am, the forest veterinary team spotted it clearly. After a struggle of 45 minutes, they managed to inject the sedative into its body. As the tusker took refuge in the reserve forest area, anti-poaching watchers prevented it from going deep into the forest. Meanwhile, kumkis Kaleem, Sujai and Pari were brought to the spot to make the wild tusker board the Forest Department vehicle. With the help of the kumkis, forest staff tied a thick rope across the tusker’s neck and legs. The kumkis struggled hard to goad the tusker into the vehicle. The wild tusker was then taken to Kozhi Kamudhi elephant camp at ATR. The movements were carefully tracked. First, an anaesthetic was given to keep the animal dizzy. As it is not safe for the elephant to remain in a sedated state for long, we also injected an anti-anaesthetic drug after the relocation process got over,” said Manoharan of the team. The crop-raiding tusker, which weighs 3,500 kg and is about 20 years old, gave in without much trouble to forest officials after two tranquilliser darts were fired at it. The sedated beast was goaded by kumki elephants to board a truck and sent to the Varakaliyar elephant camp at Top- slip amidst applause by villagers who had gathered to watch the spectacle. The forest officials were elated after the safe capture; in a botched-up operation in 2011, a sedated tusker fell into a deep pit and died. 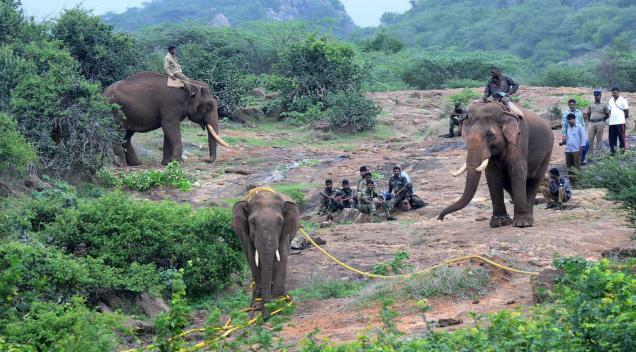 The rogue tusker has been frequently damaging crops in Madukkarai area for the past three years and had killed two persons, including a forest watcher. Following requests from farmers and the public, Chief Wildlife Warden on June 8 ordered that the tusker be captured. The details of operation are revealed to be : A. Periyasamy, who headed the operation, said a combination of Ketamine and Ketamine Xylazine was shot at the tusker on a plain terrain at the Madukkarai Military Camp. Forest veterinarian N.S. Manoharan darted the animal from a distance of about 70 meters using a tranquilizer gun. 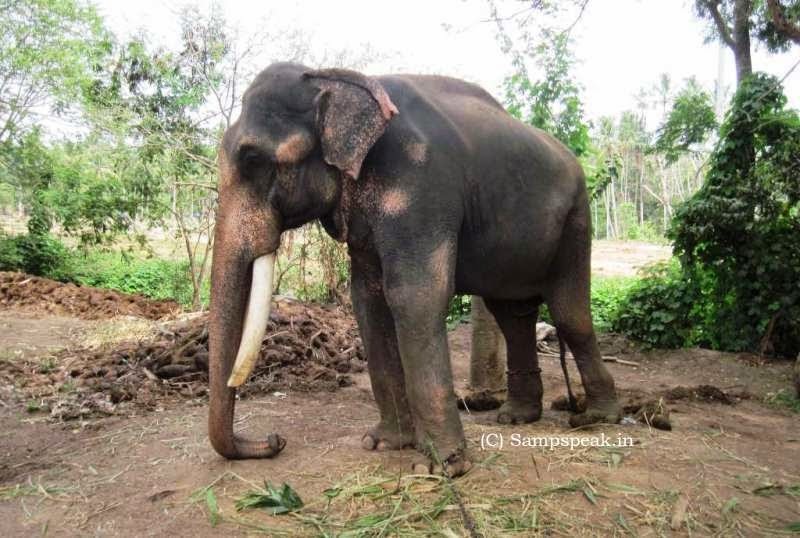 The elephant then went out of control for about 15 minutes, crossed the Palakkad Road, and reached the reserve forest area where the kumki elephants were ready to corner it. With the help of two kumkis, elephant handlers and trackers tied the Maharaj’s legs with ropes. The bushes near the wild elephant were cleared and a path was prepared using an earthmover to facilitate the elephant’s movement to the truck. A portion of the compound wall of an Electricity Board (Tangedco) office was brought down for the operation. Thousands had gathered early on Sunday morning to watch the final phase of the operation and the tusker slightly moved away from the path into the nearby bushes close to which people were standing. .. in the end, all is well – as the elephant could well be trained and become another ‘kumki’. News source : common media including Indian Express, The Hindu, Times of India.